NBC News correspondent Betty Rollin, glamorous, successful, and happily married, had it all -- and then she learned that she had a malignant tumor in her breast. Written with wit, warmth, and soul searching honesty, First, You Cry is the inspiring, true story about how one woman transformed the most terrifying ordeal of her life into a new beginning. 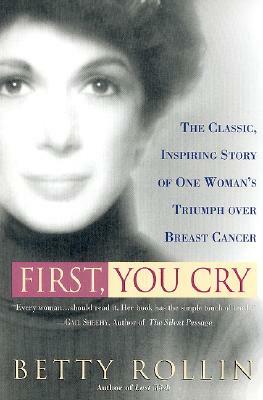 Now with a new introduction and epilogue, this unique memoir serves as a fascinating retrospective of the twenty-five years since Rollin's first mastectomy and, given the continuing threat of breast cancer, tells a story that will inform all women as it touches them with its honesty and even, humor. Betty Rollin is both a writer and an award-winning TV journalist. She is a contributing correspondent for NBC News and for PBS. Formerly a writer and editor for both Look and Vogue magazines, she has written for many national publications, including the New York Times. She and her husband, Dr. Harold M. Edwards, live in New York City.